The Gophers had a players-only meeting Thursday and later brought in head coach Tracy Claeys to inform him of their plans, sources said. According to two parents of players, all of the team’s players are planning a united announcement Thursday evening to say they will boycott the Holiday Bowl if “their demands are not met” — a reference to their disagreement with the decision to suspend the 10 players. The report was also confirmed by USA Today’s Nicole Auerbach, who said that the team plans to announce the boycott tonight. The players’ lawyer told the Tribune that five of his clients could be expelled and another four face year-long suspensions. Four of the players involved missed three home games this season due to a restraining order filed by a victim of an alleged sexual assault. They were allowed to play road games, and once the restraining order expired, they played at home as well. 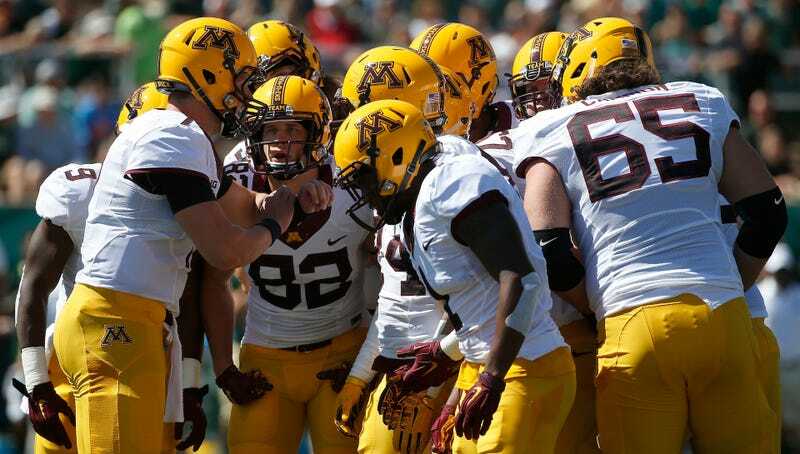 However, an investigation by the University of Minnesota’s Equal Opportunity and Affirmative Action office resulted in the fresh wave of suspensions, with Ray Buford, Carlton Djam, Seth Green, KiAnte Hardin, Dior Johnson, Tamarion Johnson, Kobe McCrary, Antonio Shenault, Antoine Winfield Jr., and Mark Williams all suspended for at least the Holiday Bowl. The victim says that a series of Minnesota football players raped her the night after the Gophers’ first game of the season, starting with Carlton Djam. She then called her sister and mother, who advised her to go the hospital. Shortly after, she called the police and they began an investigation. However, Djam insisted that it was consensual, and he showed the court 90 seconds worth of videos from that night which apparently convinced a police investigator that the alleged victim was “lucid” and “fully conscious.” Criminal charges were never filed in the case, and the Hennepin County Attorney’s office declined to prosecute. We’ll update this post when the supposed boycott announcement is made. Update, 7:51 p.m. EST: It’s getting uglier.